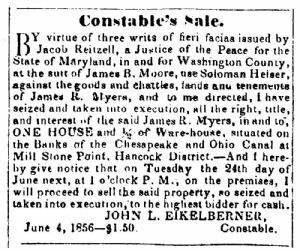 BY virtue of three writs of fieri facias issued by Jacob Reitzell, a Justice of the Peace for the State of Maryland, in and for Washington County, at the suit of James R. Moore, use Soloman Heiser, against the goods and chattles, lands and tenements of James R. Myers and to me directed, I have seized and taken into execution all the right, title, land, interests of the said James R. Myers, in and to, ONE HOUSE and ½ of warehouse, situated on the banks of the Chesapeake and Ohio Canal at Mill Stone Point. Hancock District. And I hereby give notice that on Tuesday the 24th day of June next, at 1 o'clock P. M., on the premises, I will proceed to sell the said property, so seized and taken into execution, to the highest bidder for cash.